Seeds have everything they need to continue their species built right into them. All of the accumulated adaptations, the wide range of environmental and seasonal conditions that they have encountered and grown through are encoded into their genetic material, their DNA. Everything they need to remain dormant, and then sprout when the time is right is built right inside their shells. Within that hard seed coat is enough food energy to help them break dormancy and carry them into their first several days as seedlings. All the enzymes they need to convert the stored energy into food is there as well; they have all of the fats, carbohydrates, protein, enzymes and hormones needed to get the seed off to a great start. As home gardeners and small scale growers, it is our job to provide those proper conditions to ensure maximum germination into strong and healthy seedlings that are ready to transplant into the garden when the conditions are right. In natural systems, the top of the soil network where the loose leaf matter or detritus of last season begins to decay is loose and allows light to penetrate the topmost layer. It is usually not compacted or dense at all. Water vapor is present in this layer of natural mulch, along with some inherent decomposition helping to boost the temperature slightly. The seed sprouts, receives the diffuse light and builds strength as it works to push through the network of organic matter. When it has enough strength, it breaks through that layer which then becomes a protective mulch slowly breaking down and feeding the plant. To help germinate the strongest and healthiest seedlings possible, we need to follow this pattern as closely as we can. 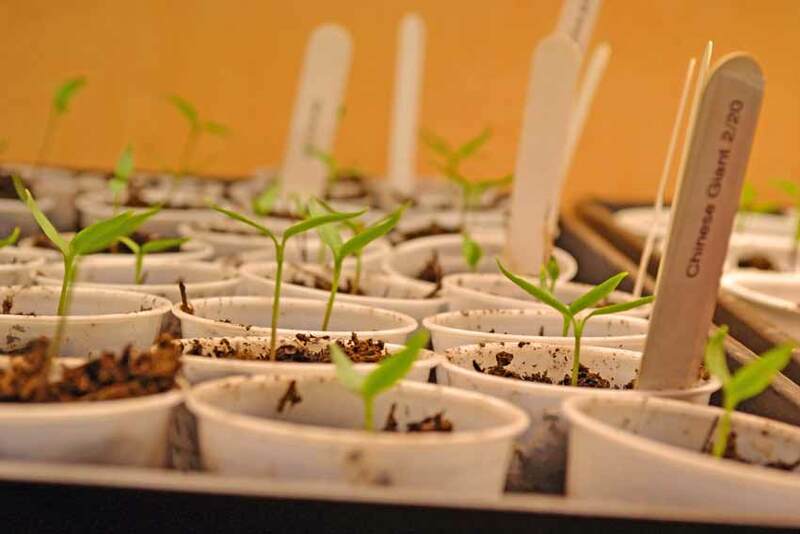 In most parts of North America, some seeds will need to be started indoors as they need a consistent temperature and the colder nights will slow the process down greatly. Heat mats or heating pads will speed the germination process up, sometimes sprouting seeds in just a few days. Even with a greenhouse, unless it is a heated greenhouse, starting seeds indoors and then moving them into the greenhouse when they are up and have their first set of true leaves is a much better way with less loss of seedlings. We have had great success with starting seeds on heat mats inside, then transferring them to a cooler greenhouse with heat mats set at a lower temperature to keep the roots warm overnight. This gives the seedlings the cooler environment that they need for strong, healthy growth but keeps the roots warm during the nightly temperature drops. Heirloom Seed Starting Made Easy shows a short video of exactly how we do it! 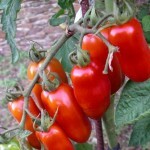 Varieties most frequently started inside are tomatoes, peppers and eggplant. Many other crops such as radish, cabbage, lettuce, pumpkin and squash can be started inside and transplanted into warm soil for intensive gardening. Some herbs and flowers need to be started inside. Remember to refer to the growing instructions for each variety on the back of the seed packet for recommended sowing methods. Cold frames can act as miniature greenhouses and are easy to build from 1 x 2″ wood and heavy poly sheeting from home improvement stores. Build it 2 – 3 feet tall so that the plants have room to grow, but you can still reach into it easily enough. A hinged roof allows for venting on warmer days. A 3 x 5 foot size is ideal for the home gardener as it is large enough to hold a good number of plants yet small enough to cover with a moving blanket or something similar on nights that will be cold and keep the plants healthy without moving all of them inside each night. A gallon milk jug or two of hot water in the cold frame before covering will get you through a fairly cold night with no problems to your tender seedlings. If needed, it is easy enough to build one or two more cold frames to accommodate the plants as they get larger without crowding them together. Successful Heirloom Seed Starting for the Home Gardener shows the advantages of starting your own seeds, along with planning and arranging what simple equipment is needed. What does a seed need? Moisture and temperature are the two most important aspects for vigorous seed germination, followed by a few other factors. Let’s take a closer look! Moisture must be at a constant level for the seed and young seedling as they have no moisture reserves in themselves like a mature plant does. A mature plant can go without moisture for a short period of time, sometimes up to several hours, but a seedling will die if it loses its critical moisture level even for a few minutes. The seed needs enough moisture to start the process of germination; but not too much as to prevent oxygen from reaching the seed, as respiration increases dramatically. Water initially starts the process by softening and splitting the seed coat, then activates nutrients, enzymes and hormones to convert stored foods into energy. Finally it serves as a means of transporting nutrients to all parts of the newly emerging plant. Watering from the bottom is the best method of keeping the moisture levels more consistent. Misting can help correct smaller areas that aren’t quite moist enough. Many seedling trays will have a bottom tray to help water the soil. The soil temperature must be correct to initiate the germination process. The key is the temperature of the soil, not the surrounding air. A room that has an air temperature of 70F may have a soil temperature of 60F or less, as the moist soil acts as an evaporative cooling medium, reducing the soil temperature below what is needed. At too low a temperature the seed remains dormant, often for an extended amount of time. Not only the ideal temperature is needed, but for the correct amount of time. This prevents the seed in the wild from germinating too early and being killed by the next frost or cold front that moves in. If the temperature swings too much from the daytime high to the nighttime low, the seed will not germinate, or do so very slowly. A constant temperature for a week to 10 days will have almost all vegetable seeds up and going well. The relationship between temperature and light changes as seeds germinate. Seeds need a high moisture and very warm environment to germinate. Both moisture and temperature levels need to be pretty constant to get good germination. If the temperature is high during the day and cooler at night, the germination will be really delayed. In the sprouting phase, the soil should be almost – but not quite – wet, with a shine or sheen to it when a light is above the soil. 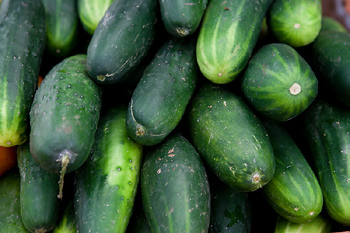 It should leave a fingertip moist after gently pushing on the soil surface. Ideally, tomatoes and peppers need 85F soil temperature to sprout. Most cool season vegetables we eat today need a soil temperature above 70F for best germination, with varieties like carrots and cauliflower needing 80F. Squash, radish, okra and pumpkin will germinate best at 95F! The soil needs some type of fertility to feed the young seedlings, not a lot but some. The seed provides the energy and nutrition needed to get the sprout off to a good start, but after the initial few days everything is dependent on the seedling developing leaves to start the photosynthetic process to provide its energy and build its reserves. Some very important nutrients will come from the soil. Seed Starting Media for the Home Gardener shows what different types of media are used for, with a couple of good seed starting soil “recipes”! What exactly is going on while the seed is germinating? Many think of germinating as being the equivalent of sprouting, but that’s not exactly true. Germination is the entire process the seed undergoes resulting in a seedling. The sprouting processes are the final steps in germination, with the emergence of a root tip and leaf from the seed coat. There is much that goes on inside before we get to see any results. The first thing that happens is the seed must absorb water to start the entire germination process. The water is taken in through close contact with the soil and depends on several factors of the seed itself. The hardness or permeability of the seed coat determines how much water can be taken up in a certain amount of time. Of course the amount of water available to the seed is highly important as well, showing that a constant supply of moisture is critical to starting the germination process off right. This uptake of water softens the seed coat, which eventually splits open to allow the root tip to emerge. At the same time the seeds metabolism goes into high gear as the seeds internal tissues absorb moisture and food that was stored in an inactive state inside the seed is transformed into energy. Starches are converted to simple sugars and proteins into amino acids. Enzymes are activated, furthering the metabolic process of breaking dormancy and becoming a living plant. Hormones are also activated, controlling how much and where newly produced foods are transported to. Oxygen uptake increases greatly. New tissue starts to grow, first at the root tip, then the stem, the bud and cotyledons or embryonic leaves. Peas synthesize new compounds within the first 24 hours of starting germination. Lettuce seeds start producing new tissue about 12 hours after the onset of germination, concentrating in the root cells. While all of this is going on inside the seed, not much will be noticed on the outside, at least not yet. The pots, cubes or flats that the seeds are planted in need to be checked at least once a day and the soil kept moist but not soggy. Steady heat needs to be maintained and air should reach the soil to allow the seeds to breathe and keep mold from forming on the soil surface. If you do find mold starting to grow, let more air in. If there is a lid on the seedling tray, remove it for a few hours or put a small fan where it can circulate a small, gentle amount of air and the mold will usually disappear. Once the seedlings are up, temperature and moisture needs change. Once the seedlings start putting on their first set of true leaves, they need less moisture and slightly cooler temperatures for continued growth. This is where beginning gardeners usually make their first mistake, by keeping the moisture levels high once the seedlings have sprouted. This can create what is known as “damping off”, which is characterized by a loss of growth in the seedling. It will have a somewhat wilted appearance with a slightly constricted stem right at soil level. There may be almost invisible flying fungus gnats swarming around. 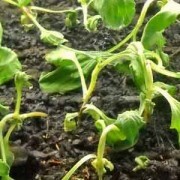 If this condition is not corrected immediately, the seedlings will fall over and die due to a fungal attack at the base of the stem. It is easily avoided by reducing the amount of water by about 10% over a few days after the seedlings sprout and start growing their first true leaves. Temperature should be reduced, as overly warm conditions create weak, spindly and sappy growth that becomes difficult to manage. Start seeds in a warm environment and grow seedlings in a slightly cooler one. A 10 – 15F reduction in temperature is all that is needed for strong and vigorous growth. Steady and strong light is needed once the seeds have started to germinate and need to start photosynthesis to provide energy for themselves. Light from a window is sometimes not enough, and the seedlings will fail. Two of the biggest killers of seedlings are too much water and not enough light. 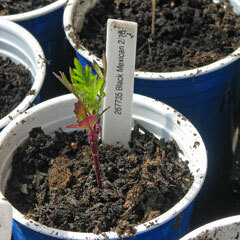 Seedlings will get really “leggy” or tall, pale spindly with too little light, as they stretch to find more light. Once seedlings are up they need a lot of light, more than most people think. There is no harm in providing too much light, as the plant will use as much as it needs and then stop using the light energy. The danger to lots of light is in drying out the soil, especially when using high powered grow lights or a very warm south-facing sunny window with seedling trays in it. If the soil dries out, the seedlings will die very quickly. This is something that is easy to monitor and correct with close observation, and can be avoided with a bottom-watering setup. With some diligent daily observation and a tiny bit of luck, within a couple of weeks the new seedlings will be ready for transplant into a larger pot or directly into the garden, depending on the weather and timing of your seed starting. This may all sound very complex and complicated, however, please realize that seeds have been germinating and producing new plants for untold millennium without our help. We as home gardeners are just trying to help the process along, allowing us to have much better production from our garden than we could ever get by sowing all of our seeds directly into the soil. A Garden Journal is a great tool to record the successes and challenges of your seed germination project, so that you can see ways to improve or experiment with your particular process next year. Most gardeners develop very effective methods for seed starting within just a couple of years and only fine tune the process from there. Fine article, but one thing you all say, but I could never grasp the reason for: Why does everyone put their seed into a tiny cube of one sort or another, then go to the labour of repotting it into something larger, sometimes more than once, ie, transferring the seedling from container to container to container? I seed my tomatoes, peppers, squash and flowers into their first and final containers, usually a pint milk container or for tomatoes the larger, 2-quart gallon juice jugs. I usually start them on a heat mat in a minigreenhouse, the kind you buy as a little unit about 10″ X 20″. There they thrive & remain until I place them on the window sill, and then outdoors for hardening, and then into the garden. By avoiding the tiny seeding cubes I don’t have to worry that the south light on the window sill will dry my seedlings out, which has happened just once too often for me. Wyandotte, you’re not missing anything! You just have a little different way of starting your seeds than others, that’s all. If you have the space to start your seeds in their final container that will be transplanted into the garden, that is the best way. You have more soil volume so that moisture management is much easier than smaller seedling trays or small pots. Most people, including us, don’t have enough space for all of the seedlings we start, so the transplanting becomes necessary. Our germination rack is much smaller than the bottom-heated boxes in the greenhouse, so we have to do one to two transplantings before they are ready for the garden. Thanks for confirming that Wyandotte is not doing anything wrong. I’m with them in really wondering why to design a setup that requires so much transplanting. your answer makes a lot of sense too. I’ll be starting off very small scale this year and really want to make sure I get it right for my first year in the garden. You are welcome Jake! 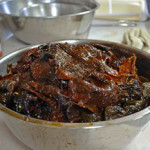 We have found for our uses that paper pots made from newspaper and wound around a paper pot maker to a thickness of 5 layers is perfect for us for starting tomatoes and peppers. This gives the pot enough structure to last long enough to get it into the ground, but just barely so there isn’t any worry of the plant being root-bound by the pot not decomposing. Do some experimenting and find what works best for you and your setup! Thank you for the detailed article. You are most welcome! I’ve found an increasing need and want for more in-depth articles to help round out the overwhelming amount of introductory ones. Tks for your reply in any case! And Green Thumbs Up. Way up! You bring up a great point, Wyandotte! If you have the room, it really does make sense to start in a larger container. 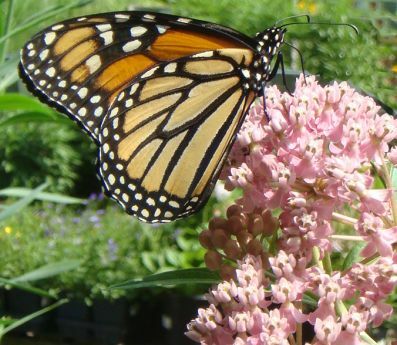 You can start flower seeds inside like vegetable seeds, but for the most part people have much better success duplicating the natural cycle of scattering the flower seeds in the fall and lightly covering them with soil to prevent the birds from getting them. The seeds will overwinter, lose their germination inhibiting coating and then sprout when the conditions are right in the spring. It seems when people have challenges in getting flower seeds to germinate it always happens inside or in controlled environments like a greenhouse. When done outside and left alone, they almost always do very well.